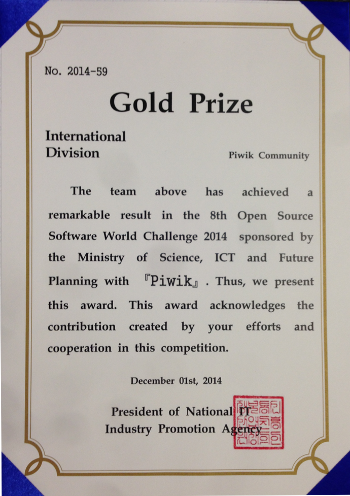 We are excited to announce that Matomo (Piwik) has been awarded the Gold Prize in the Open Source Software World Challenge 2014! Winning this award is a testament to the positive impacts of the Matomo (Piwik) platform worldwide. Every day dozens of new people are embracing Matomo to power their web and mobile analytics which gives them full control over their data. Every member of the Matomo (Piwik) community, from core developer to beginning user, should be proud to be part of this momentum: congratulations to us all! 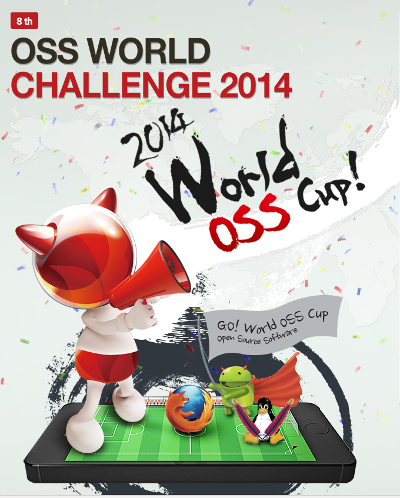 The Open Source World Challenge is the annual competition hosted by the Ministry of Science, ICT and Future Planning of Korea. This competition is mainly intended to promote open source software and expand various exchanges among open source software developers worldwide.